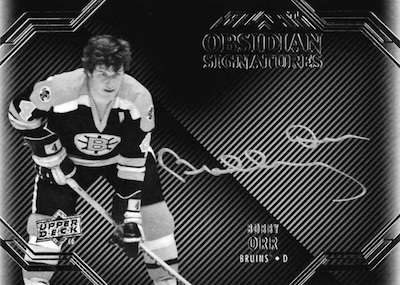 Boasting only on-card signatures, 2016-17 Upper Deck Black Hockey returns with a tweaked format and 25% lower price point. Each box contains at least two autographs along with two other hits. This marks a drop from 2015-16 UD Black, which had five total hits per box. Falling one per box, the 40-card base set comes in a main version, numbered to 299, in addition to Gold Spectrum (#/25) and Black & Blue (1/1) parallels. 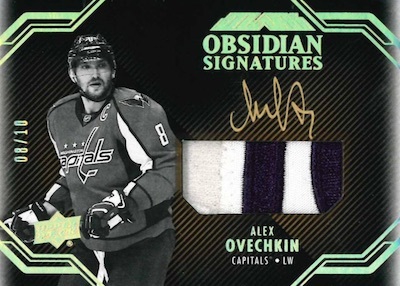 Occupying the remainder of each box, hits take many forms in 2016-17 Upper Deck Black Hockey. Leading the way are the hard-signed autographs. 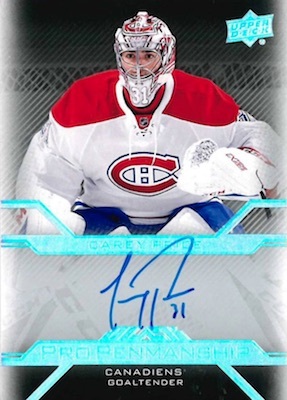 Young stars can be found in the Rookie Signatures set, with Levels limited to 249, 149 or 25 copies, while Lustrous Rookies tackles 35 of the top rookies with acetate and an on-card signature. These also come in Black & Blue parallels, limited to five copies. 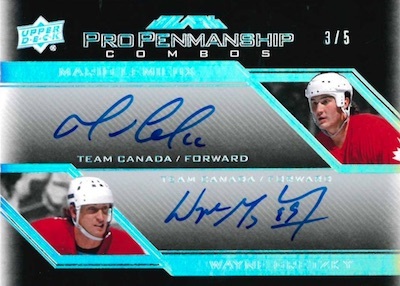 Similarly, the Pro Penmanship Autograph inserts incorporate acetate and are available as Combos and Trios. Color Coded Autographs (#'d) and Autographed Relics (#'d) promise the "most stunning on-card autographs of the year." 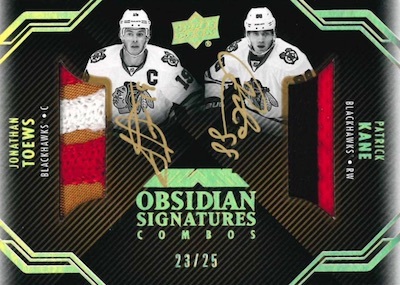 The Obsidian Signatures insert is another striking auto-relic choice. Not to be outdone, memorabilia cards have strong representation in 2016-17 Upper Deck Black Hockey, as well. This includes base Black Hole Jersey (1:3 packs) and Black Hole Jersey Autograph (1:5 packs) inserts for rookies, stars and all-time greats. Parallels include Premium Relics (#/15) and Premium Relic Autographs (#/10). 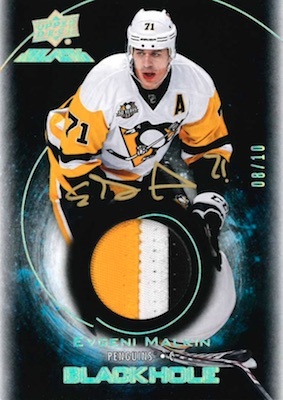 Showcasing jumbo swatches, Star Trademarks and Rookie Trademarks provide base jersey cards plus Autograph (#/5) versions. 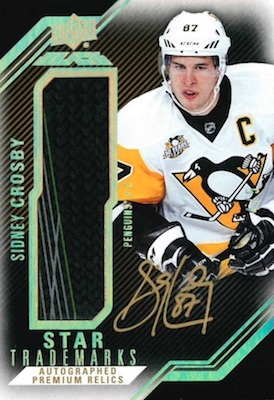 Finally, premium books add to the pulls in 2016-17 Upper Deck Black Hockey. This includes Quad Jersey and Quad Patch Booklets for top players. 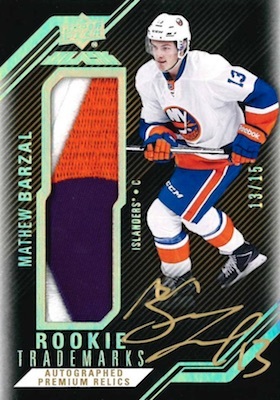 Meanwhile, Fresh Gear Booklet cards contain glove, jersey, patch and stick pieces for popular rookies. The Fresh Gear line also has a rare Autograph parallel. PARALLEL CARDS: Gold Spectrum #/35, Black and Blue Spectrum 1/1. PARALLEL CARDS: Gold Spectrum #/35 (Auston Matthews - #/5; No Jimmy Vesey*), Black and Blue Spectrum #/5. Overall Odds - 1:2.5 packs. Specific group odds noted below. Overall Odds - 1:5 packs. Specific group odds noted below. PARALLEL CARDS: Auto Premium #/10. 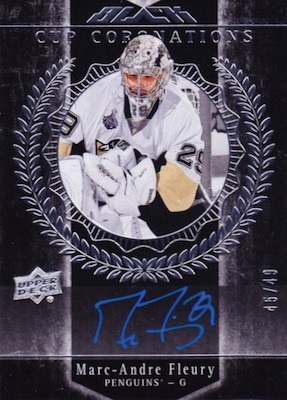 PARALLEL CARDS: Black 1/1 (No Savard, Josi*). Overall Odds - 1:4.5 packs. Specific group odds noted below. 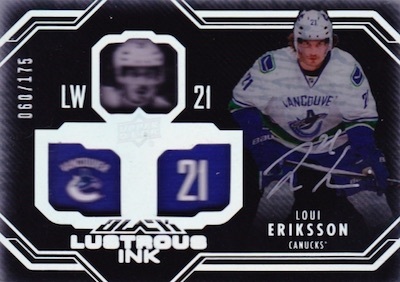 PARALLEL CARDS: Spectrum #/25 or less (No Laine*). Overall Odds - 1:100 packs. Specific group odds noted below. Overall Odds - 1:3 packs. Specific group odds noted below. PARALLEL CARDS: Spectrum #/49 or less, Black and Blue #/5. PARALLEL CARDS: Spectrum #/20 or less, Black and Blue 1/1. 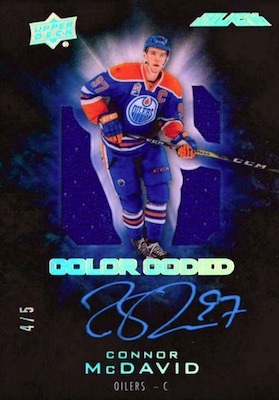 PARALLEL CARDS: Spectrum #/6, Black and Blue 1/1 (No Ehler/Laine/Scheifel*). Overall Odds - 1:10 packs. Specific group odds noted below. PARALLEL CARDS: Premium #/10 (No Marner). Yeah, 25% lower price…We will see about that. In the meanwhile, last year there were 48 cards per case, this year there are 50 cards per case. The major difference is that last year there was a confirmed Lustrous Rookie per box, while this year this card has been removed. You can get one/box, but there’s no guarantee. We shall see, but instead of 8 Lustrous Rookies /case from last year you may get something like 5 Lustrous Rookies/case this year…It’s good they lowered the price, but they should have at least kept one Lustrous Rookie/box. All in all, the average price per card for this year is 45$. That being said, it’s clear that many of those 50 cards in a case will be absolutely worthless jersey or base cards with a very, very low selling value. On the other hand, the cards look very nice, but boy they are expensive. Are they still going to release this set in December or just cancel it since The Cup is slated for late October and is typically the final set of the year. Correct. UD Black is out today, December 13 (Wednesday). Just broke a case of this stuff. Got many hard to find cards but of all crappy players. Mike Hoffman numbered to 5, Tyson barrie / 25, Minnesota Wild booklet / 10, Lundqvist auto / 10. Otherwise, I have never seen so few stars or re-sellable cards in a case in my life. This stuff is garbage! There are a lot of hits left for everyone else. Broke two boxes, nothing but single color swatches and the autos were lower tier players with the exception of Lundqvist auto numbered to 25. For the price, not worth dropping the dollars. Would be an excellent product if priced at about half of the cost, but that is not going to happen. Not much for a 90 second rip. Many of the cards i received came with significant damage. very disappointing considering how much money these cards are.